A compilation of inspired poems and other creative works in support of the conservation of White Lions and Leopards. Soft cover. Spiritual enlightenment? Inspiration? Ready to conserve? Come and walk with the White Lions through these pages – and prepare yourself to make a positive difference. When the higher meaning behind Africa’s most illusive apex predator was brought to the world in Linda Tucker’s book, Mystery of the White Lions (2001), artists, poets, visionaries and every day people across the globe were awakened to the importance of these luminous beings. According to ancient indigenous knowledge, the White Lions - and now the sacred White Leopards of the African bushveld - are prophetic animals that have arrived at a time of evolutionary and climactic change. These beings, so revered, are in many cases bred for the sole purpose of being hunted. Kept in cages, they have no freedom, no choices, and no respect. The fact that these rare creatures are persecuted and mercilessly hunted is a grave reflection on the state of humankind today. These words apply not only to our fellow man, but to all other beings that inhabit this wonderful planet of ours, most especially, South Africa. 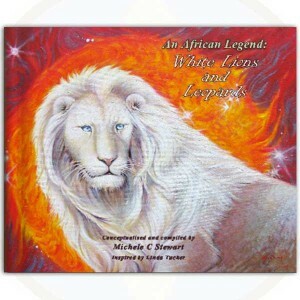 Michele Stewart was divinely inspired to put together a poetry and artwork competition, with the aim of raising awareness of the White Lions and other heavenly creatures. With support from the Global White Lion Protection Trust and the Leopard Conservation Project, contributions from published poets and housewives, rock stars and accountants, teenagers and sectarians, from all walks of life and from every continent, were received. This book is a compilation of the winning gems, and forms a collector’s treasure-trove for future generations. May we all use our freedom responsibly, and make a difference to our world. After much discussion about how to support Conservation efforts of The Global White Lion Protection Trust and the Leopard Conservation Project, Michele came across the idea of a Poetry and Artwork competition, resulting in this wonderful coffee table book. Michele thanks all the amazing people that submitted their work - the quality is awesome! Michele loved working on this project, and is thrilled that all proceeds will go to these 2 amazing conservation efforts.